I spent 1 resource to play Fire Axe. I spent 1 resource to play Rabbit’s Foot. Never hurts to be prepared, Ol’ Pete always says. I exhausted Duke to Investigate, drawing a tablet token, passing 2 v. 2 and taking a clue. At the end of the round, I drew Scavenging and gained a resource. 1 of 3 doom on the Agenda. I drew Swarm of Rats from the Encounter deck, causing it to engage me. I probably need to call the exterminator. It’s really bad when your house has rats. I attacked the Swarm of Rats, drawing a -1 token for 1 v. 1, killing the Rats. I exhausted Duke to Investigate, drawing a skull token, giving me 4 v. 2, taking the second clue. I chose to use my two clues to progress the Act, putting the Attic, Cellar, Hallway and Parlor locations into play. I feel through the Study door into the Hallway and realized the Study would be inaccessible until I’d sorted my house out. Given that hallways are boring, I moved to the Cellar, taking a damage as I slipped down the steps and bumbled around in the dark for a bit. At the end of the round, I drew Dig Deep and gained a resource. 2 of 3 doom on the Agenda. I drew Ancient Evils from the Encounter deck, adding a doom to the Agenda and progressing it. Given the choice between taking horror or discarding a random card, I chose to discard. I discarded Scavenging. I guess I won’t be able to find anything in the Cellar. I needed a little light, so I played Drawn to the Flame, drawing Crypt Chill from the Encounter Deck. I drew a skull for the test, avoiding the negative penalty with a 4 v. 4 result. I then took two clues from the location, completing the room. I moved to the Hallway. I then climbed up to the Attic, being forced to take a horror as I looked around at the stacks and stacks of board games I’ve bought and will likely never play again. At the end of the round, I drew a Fire Axe and gained a resource. 1 of 7 doom on the Agenda. I drew Rotting Remains from the Encounter deck. I drew a skull token, passing the test with 4 v. 3 and taking no negative effect. I played Dig Deep since it never hurts to be prepared. I exhausted Duke to investigate, drawing a 0 and passing with 4 v. 1 result. I gained a clue, leaving one in the Attic. As a free action, I discarded Fire Axe to ready Duke. I exhausted Duke again to investigate, drawing +1 and passing 5 v. 1. I gained another clue, completing the Attic. Duke loves playing in the Attic, but it’s probably time to head back downstairs. At the end of the round, I drew Guts and gained a resource. 2 of 7 doom on the Agenda. I drew Frozen in Fear from the Encounter Deck, putting it into play in my threat area. I spent two actions to move to the hallway. Those Attic stairs were scary, but I muscled through it. I spent 3 clues to advance the act, spawning the Ghoul Priest in the Hallway, who immediately engaged me. Also, Lita Chantler spawned in the Parlor. I don’t know her. I’m not sure why she’s in my house. I’ll sort her later. I spent three resources on Dig Deep to increase agility by 3 and then attempted to evade the Ghoul Priest. I drew a cultist token, passing the test with 5 v. 4. At the end of the round, I drew Lucky! and gained a resource. 3 of 7 doom on the agenda. I drew another Swarm of Rats from the Encounter deck. I definitely need to call the pest control people. This is bad. How many swarms of rats are there in my house? I exhausted Duke to fight the Ghoul Priest, drawing a skull for -1. I chose to spend 1 resource for Lucky, causing me to pass the test 5 v. 4 and dealt 2 damage to the Ghoul Priest. 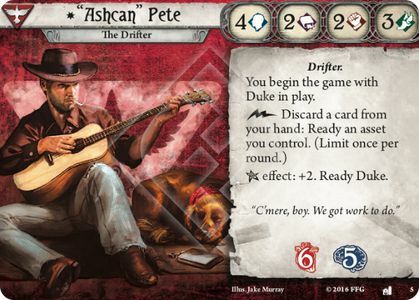 I discarded Guts to ready Duke and fight again, drawing a +1 token and passing 5 v 4, dealing another 2 damage. I then attacked with the Fire Axe, spending my last two resources to increase my combat value to 6. I drew an Elder Sign token, dealing the damage needed to kill the Ghoul Priest. This caused the Act to advance, ending the scenario. Lita asked me to burn my house down and I said “Hell No!”, so my house is still standing. I earned 1 exp for refusing to allow the night’s events to destroy my life. I earned 4 exp from the Victory Display for fully exploring the Attic, the Cellar and for killing the Ghoul Priest. I earned an extra 2 exp for gaining insight into the hidden world of the Mythos. Warhammer 40k 8th Edition... WHEN!?!?! Runewars - Waiqar the Undying Priming!